Lovely pattern and good quality. The blanket is not very heavy, I’d describe it as medium weight. Bought 2 for my guest room. The decorative pillow pulls it all together. It’s very hard to find bed sets that are not all synthetic, so I’m happy with this set. The Madison Park Essentials Roxanne Complete Bed and Cotton Sheet Set transforms your space with rich colors and a modern style. A floral motif in a deep grey is printed across the comforter and matching sham, for a chic coordinated look. The solid reverse and bed skirt beautifully accent the top of the bed, while an embroidered decorative pillow with a floral design provides a gorgeous finishing touch. Also included is a 100-percent cotton sheet set which features a patterned design that complements bedding set. Instantly restyle your bedroom with the contemporary look of this complete bed and sheet set. Nice quality but a bit smaller than I’d like for a Queen size. Had to leave a 4 inch gap at the top to reach the bed skirt at the foot. I do have a mattress topper but it isn’t huge. Also, there’s a lot of peach in the flowers, not beige as the pic shows and it’s a blue grey. I love the comforter and the pillow cases but man the sheets are awful! They don’t even fit my king size bed at all. If your not looking for sheets this will be a good buy for you. This comforter and sheet set is very light and comfortable. And of course, I like the Flower style which makes one relaxed. I recommended this set. This comforter is exactly what I wanted. Not too heavy and very soft. The colors are exactly like the picture, and it fits my king sized bed perfectly. The only complaint I have is the sheets are fairly thin and not soft at all. Overall, I would by this set again just for the comforter. 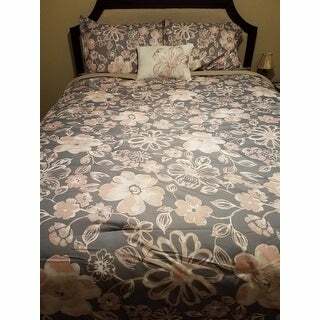 This comforter and sham are very pretty and have a nice soft feel. The weight of the comforter is ideal, warm enough but not too heavy. Only complaint is that the sheet set is not very soft, the fabric is a bit scratchy. It is a very pretty set and a great value! Great comforter set for a great price! I had actually viewed this on another site before purchasing at Overstock, and it was way more expensive! Sheets feel nice and everything was as described. Great bedding set for the price. I was not very happy with this bedding set and should have returned before my 30 day window expired. It is now setting in a closet . The color is much more bland than the photograph and the quality is sub-par. I would not recommend. I really loved this set and was sad to have to return it. It just was more on the blue side then grey. Great buy. Overstock makes returns easy. love this. yes I would recommend this. Nice look, but the colors could be a little more vibrant. Fabric is good. It's in my spare bedroom, and it serves it's purpose. Great price and nice material. Perfect for a guest room. "What is the thread count on the sheets"